This type of THG optical switch will make available more 'colours' to be used in spectroscopy, enabling researchers to gain a new understanding into matter. Graphene THG optical switches could also harness previously unused optical frequencies to transmit data along optical cables, increasing the amount of data that can be transmitted and therefore increase data speeds. "Our work shows that the third harmonic generation efficiency in graphene can be increased by over 10 times by tuning an applied electric field. Electrical control of the third harmonic enhancement can be achieved over an ultra-broad bandwidth, paving the way to electrically-tuneable broadband frequency converters for applications in optical communications and signal processing," said the paper's lead author Giancarlo Soavi from Cambridge Graphene Centre, University of Cambridge, UK. There are currently commercial devices using nonlinear optics for optical switches in spectroscopy. 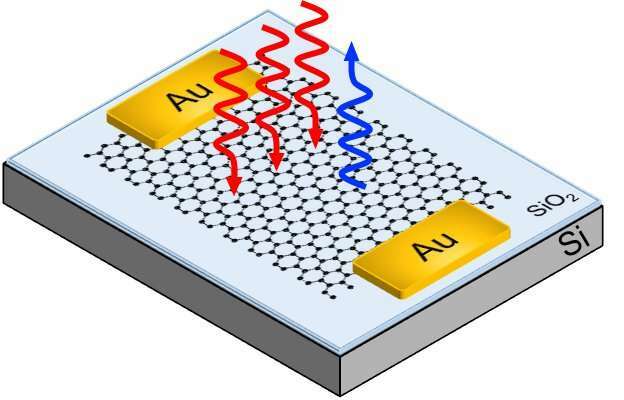 However, using graphene for THG can enable integration into devices working over an ultra-broad bandwidth. "Our initial research demonstrates the feasibility of this approach so now we want to move closer to producing integrated devices in optical fibres and waveguides," said Soavi. "The authors found again something unique about graphene: tuneability of THG over a broad wavelength range. As more and more applications are all-optical, this work paves the way to a multitude of technologies," said said ICREA Professor Frank Koppens from ICFO (The Institute of Photonic Sciences), Barcelona, Spain, who is the leader of the Photonics and Optoelectronics Work Package within the Graphene Flagship. Professor Andrea C. Ferrari, Science and Technology Officer of the Graphene Flagship, and Chair of its Management Panel, added "Graphene never ceases to surprise when it comes to optics and photonics. The Graphene Flagship has put significant investment to study and exploit the optical properties of graphene. This collaborative work could lead to optical devices working on a range of frequencies broader than ever before, thus enabling a larger volume of information to be processed or transmitted."